But it’s not simply that Rory—around whose charmed existence the show (much like Stars Hollow) revolves—gets the things that Paris wants. It’s that she gets them effortlessly, in sharp contrast to Paris’s unapologetic striving. Rory’s charm seems directly tied to her ability to be told relentlessly how incredibly special she is without developing enough self confidence to weather any criticism. She doesn’t let remarkable intellect get in the way of fulfilling the role of the perfect ingenue. Never is this contrast more explicit than in the saga of the Yale Daily News editorship. Paris, undone by a combination of her combative leadership style and a failure to live up to her own exhaustive standards, is ousted in a coup cushioned by her roommate Rory. The staff, evidently unconcerned about similarities between the friends or their own internal ambition, beg Rory to take the helm and in classic Gilmore style she “Who me?”s her way into the role of heroine, and naturally perfect editor. At the end of the seventh season, Paris seems to finally be enjoying the spoils of her otherworldly determination. But a happy relationship with an intellectual equal who also views her as such and an array of elite acceptances don’t mean much if they’re not scripted by Amy Sherman-Palladino. Look, honestly, it’s difficult to pull any meaningful analysis out of the Netflix reboot Gilmore Girls: A Year In The Life. The editing is loose and indulgent, the passage of time inconsistent in relation to the original series as well as internally (seasons turn over between episodes and yet the plot continues as if it’s the very next day), and something like half the scenes are narratively irrelevant, self-contained set pieces like the full Stars Hollow musical. And then there’s Rory. It’s unclear if her added smugness is an intentional, self-aware nod to the flaws fans found annoying in the original series or if the creators are so enamored with their character they don’t see how a lack of any meaningful maturity only exacerbates Rory’s self-absorption. My husband floated the idea that the entire series is a cautionary tale about how privilege kills creativity. How you interpret Rory’s disappointment with a version of adulthood that doesn’t immediately recognize her brilliance (remember: she reads books) and expects her to keep working even after some buzzy success (pitch her own ideas? but haven’t you heard, she had a piece in the New Yorker!) colors how you see the rest of the characters in the moralizing universe that is a mostly warmhearted fictional television show. The reboot gets one thing right: Rory’s pleasant passivity is terrible practical advice for adult women looking to get ahead. And though this gave me early hopes that Paris’s career success in comparison to Rory’s struggles would represent a sort of retribution for loud women everywhere, I mostly wish they would just let her be happy. One of the first predictions I made after the opening episode of A Year In The Life was that Paris and her college-boyfriend-turned-soon-to-be-ex-husband Doyle would get back together in the end. This is not a bold prediction by any means. Despite a stab at some more serious issues, Gilmore Girls is not a dark show, and wrapping up Paris’s plot neatly and nicely would have been easy enough—certainly easier than establishing a new paramour for her or spending any meaningful time on how she’ll handle single motherhood. And yes, of course, female characters can aspire to more than just marriage (although I always feel like the pressure to include such a caveat ignores the reality that most people crave interpersonal relationships) so let’s consider Paris’s career as the self-described Pablo Escobar of the fertility world. Facilitating family expansion doesn’t seem especially in keeping with the Paris we knew from before, but maybe becoming a mother herself has softened her? Maybe adulthood has given her a new perspective on the strained relationship she seemed to have with her own parents? Not so, judging by the fleeting scenes with her children. Dissatisfaction with her own standing in the world is a familiar place to find Paris, but this reads very differently on a successful 32-year-old mother than on a surly teen. But, the show doesn’t dive into any of that. Sherman-Palladino, it seems, is about as interested in the non-Gilmores of fictional New England as the titular ladies themselves are—which is to say: not very. Paris is presented as angry because that’s when she’s funniest. 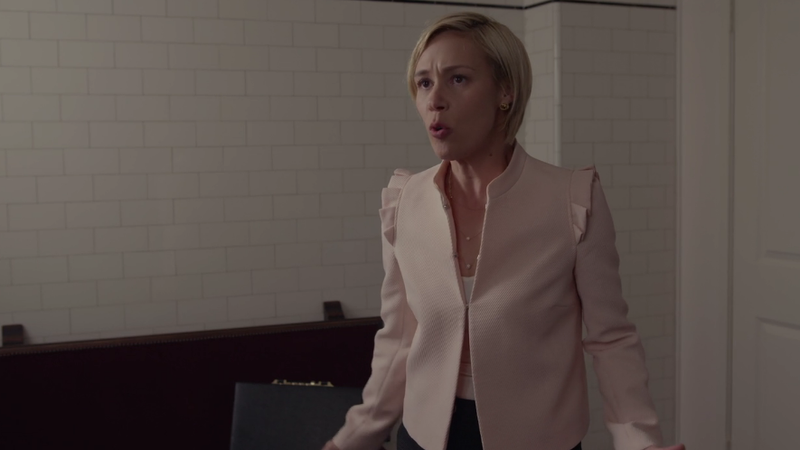 The levity of her character—which is a credit to actress Liza Weil for existing at all—seems to hinge on the moments when she’s lashing out after being humbled. This worked to humanize her early in the show and is still played perfectly—the line about the empty briefcase is the most successful joke in six hours of television—but it all feels needlessly cruel now; as if the nicer, more feminine Gilmore girls of the world are laughing at her for having a mid-divorce mini-meltdown in her high school bathroom. On the same visit back to Chilton that sees Paris humiliated by the mere presence of a decades-old unrequited crush, she and Rory pay a visit to the dean of their alma mater. Rory receives an open-ended offer of employment—she blushes, demurs, and later ridicules the suggestion—after engaging the dean in some light mocking of her longtime friend for daring to have an abrasive personality. This particular moment of one young woman ingratiating herself with an esteemed man by participating in the belittling of another woman who is less accommodating felt openly disgusting. Gilmore Girls doesn’t owe us a feminist manifesto just because it passes the Bechdel test. It doesn’t have to have a political point of view and indeed, it does not. Most conspicuously this absence is obvious in the reboot where even erstwhile Obama-campaign reporter Rory Gilmore manages to ignore the election that consumed the rest of the country for at least the last 12 months ending in early November, 2016. But this is a show that has former teen mom Lorelai end up at an inn called The Independence. Its appeal stems from (rightfully) treating the internal lives of teenage girls and widows with dignity. And besides, goddamnit, even Kirk ends up happy with Lulu and the pig.